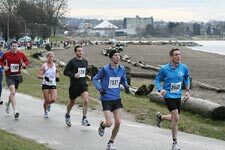 The British Columbia Road Running Series consists of 14 races throughout the year from January to July, in the Lower Mainland, on Vancouver Island, and in the Interior. Many are also part of a regional series. All races are sanctioned by B.C. Athletics, and all courses are certified. To be considered as a Series participant and thus be eligible for Series awards*, runners must complete a minimum of five (5) Series races, out of a possible 14. Note: Where more than one distance is offered, only participation in the designated Series event is counted. The points are calculated based on your gender, finish time and the race distance. The same formula is used for the Island Race Series. Each race result produces a score between 1 and 1000.
where t = time in seconds; D = distance in kilometres; and ^ indicates exponentiation. Throughout the Series, the points are added together from your best five (5) races, to determine your ranking among other participants. The final Series scores for those completing 5 or more races* will determine the male and female recipients of the following prizes, to be presented following the final race of the Series (Summerfast 10k, July 18, 2015). In addition, a number of Timex watches will be awarded as draw prizes at each event. * To receive BC Road Running Series prizing, you must be a member of BC Athletics: Competitive, Road & Trail, or Masters.